In the United States, there was a time not long ago when everyone with an iPhone had unlimited data. It was actually a requirement with AT&T. If you wanted to walk into an AT&T store and walk out with an iPhone, you had no choice. Now, most cellular carriers in the US are not even offering unlimited data, and for those grandfathered in, the carriers are even working on ways to remove the unlimited data you already have. It’s sad, but what can we do? All we can do is carefully monitor our cellular data Everything You Can Do to Cut Down Your iPhone Cellular Data Usage Everything You Can Do to Cut Down Your iPhone Cellular Data Usage If you’re sick of running out of data or racking up massive bills, it's time to take control of your usage and restrict what your iPhone can do online. Read More usage in an effort to avoid overage charges from the carrier. The cost for going over on a data plan can be rather high, and avoiding it can save you a lot of money. 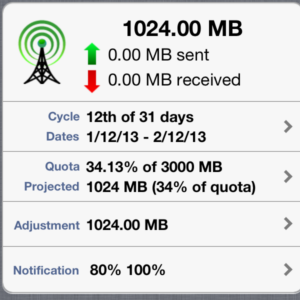 Data Master is a great app that will help you keep track of your data usage throughout the month. This will make it easy for you to avoid those overpriced data charges. Best of all, you can get the app free from the App Store for a limited time [No Longer Available]. The app normally sells for $0.99, so this is your chance to save a buck, and possibly a lot more by not going over your data limit. When you first boot up the application, it will take you through a quick set-up process to get up and running. You will need some information such as how much data you’ve used so far in the month and when your billing cycle begins. In order for the app to know exactly how much data you’ve used, it needs to know exactly when a new month begins for your phone. The app gives you all kinds of information that helps you control your data usage. You can see information such as your average usage per day in both upload and download. It will show what percentage of your data you have left and how many megabytes you have to work with. It will also show you how many megabytes you can use each day to stay under your goal. The app allows you to use custom counters to keep track of certain things. It comes with some counters by default such as data used since last run, and last device reboot. You can click the “+” to add a new counter. You can name it anything you want and then choose a certain start and end date for the counter. This feature comes in handy if you are going on vacation and want to know exactly how much data you used during the trip. You can also view your usage history from within the app. This will show you a detailed graph of your data usage so you know on which days you run through the largest portions of your data. Obviously you will need to have used the app for a while before this screen becomes useful, because it needs a large amount of data usage to fill in the graphs. You can email the data usage to someone else, which could come in handy if you want to show a family member how much data you’ve consumed. The app can also monitor your Wi-Fi usage, so if you are concerned about how much you are using on Wi-Fi, simply click the Wi-Fi tab in the app, and you will be able to keep track of that along with your cellular data. If you are looking for a way to take control over your cellular data usage, Data Master is the perfect app for you. It gives you all the key information you need to monitor your data in a slick, easy to use package. As a bonus, you can grab the app free from the App Store for a limited time. Don’t wait though, because before you know it, the app will go back to full price, and you will have missed your shot to monitor your data for free. Installed. Start playing around with! Anything like this in the Google Play market?